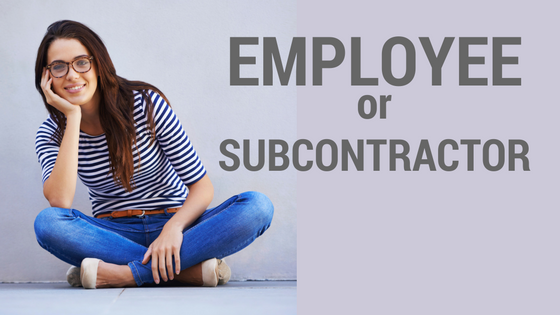 Are you an employee or a self-employed subcontracted Cleaner? This seems to be the burning question in the maid service industry. We recently noticed that several cleaning companies in Winnipeg are hiring house cleaners, giving them set routes and calling them sub-contractors. Is this right? Is it fair? What does Revenue Canada say? First of all: Why would a company choose to hire Subcontractors? Sounds like a sweet deal for the payer, no? It depends what kind of business you want to run. If a Maid Service hires sub-contractors they cannot set the standard of clean, they cannot provide a consistent and uniform service and they cannot set or manage to an expectation. We are so passionate about this because for us, it is more than just money. We want to be the best, we want to create systems that orchestrate ourselves to be BEST. And setting, training and managing to the expectation is how we prove to our customers that we ARE the best. That is why we only hire Employees in our Maid Service business. Yes, there is more cost involved but that is an uncompromisable, fundamental piece of running a maid service business. You can’t have the best of both worlds. You cannot hire employees and pay them as sub-contractors. That is illegal and there can be hefty fines imposed for doing it. If a worker and a payer enter a working relationship and upon mutual agreement decide that they will be called sub-contractors, but the payer wants to train them, manage them, tell them where to work and when to work; they are not sub-contractors. By definition, they are EMPLOYEES and as employees they are entitled to all the things above and MORE under The Employment Standards Act, the Employment Insurance Act, The Canada Pension Plan and The Income Tax Act because in Canada you can call a worker whatever you want, but that does not change WHAT THEY ARE. And what they are is determined by the facts. The Canada Revenue Agency decides. If you are unsure if you are an employee with entitlements, or if you are a self-employed subcontractor, you can apply for a ruling from Revenue Canada. I have recently started working as a cleaner for a small local buisness, she finds us the jobs and tells us were we need to go and for how long and that we have to provide our own cleaning products ,i was also told that i was classed as a selfemployed person and that i have to claim for my own tax and insurance? Does this mean she is actually sub contacting out work?. we have someone cleaning our buildings. How can we tax him,??? What we will do as the business who owned the building and how can the cleaner pay tax for this?? Thank you! Is the person an employee of yours or a subcontractor? The wife of an employee. If she is doing work for you, sounds like she should be on the payroll. We currently do not have crews in Edmonton.